Hi, I'm a newbie to Seabreeze and it's great to see so much activity in the forum and so often. I picked the "How To" category because its relevant on a few fronts. I haven't been on a windsurfer since 2000 (when at best I could be described as an intermediate) and have recently decided I need some adrenaline back in my life! - how to buy such a rig for a reasonable budget! Hope that's not too much to ask of my 1st post, but I do need all your help!. The great news is that since 2000, kit has moved on a lot. Boards are now shorter and wider, and easier to sail. Rigs are lighter, more stable and have a wider wind range, and are much easier to sail as well. In terms of booms, a carbon boom is fine second hand, but I wouldn't touch an alloy boom second hand, but a new aluminum boom will be good for 3 years (one of my carbon booms is now pushing 20 years old). You might care to read the earlier entries of a thread called "Windsurf Learning Curve" the long running saga of Morgs and co and his adventures learning the best sport since the spirit of god moved on the face of the deep. Thanks very, very much for that. You hit the nail on the head with my 2000 rig setup! I'm not seeing too many of those old clunkers around. That said, at a sailing club nearby (on a flat water lake/bay) there are (experienced) guys on larger boards, around 200L - big bloody things. I don't know what make/model/design these are. Perhaps they are suited to lighter winds (i.e. not planing)? Appreciate the link - a great read! Those large boards are called 'Formula' and typically about 160L. They are ridden with 10, 11 or 12m sails and 700mm fins. Fairly technical to ride, and not for the faint hearted, but they can plane in about 8kts or less by the looks of this video! Oh, and lose the moustache. In the last 15 years, facial grooming has changed too. Coincidentally I too am returning after a 15 year layoff. I went at it pretty hard from about 1982 to 1992 (see avatar). I dragged my Precision Equip custom wave board and RAF Wave sails from 1985 out of the shed. I had to shake a lot of mouse poo out of the sails, they looked fragile but worked fine. Trouble is everyone at the beach pointed and laughed at my gear... and me. A few weren't laughing when I blew them off, that was until my arms pumped up and I went home. Under some pressure I bought new secondhand stuff starting with a 5.0 Neil Pryde Search sail, carbon mast and clamp on booms (no more tying the booms on with a knot). Rigging the gear was quite different and took a bit of figuring out but I was amazed at how, the harder the wind blew, the faster I went, I never felt over-powered like the old days. The 8'6" wave board was still drawing a lot of laughs so last night I bought a secondhand Quatro Freestyle Wave 75. It weighs nothing so I'm really looking forward to giving it a go this weekend. I'm now 90kg which apparently violates some bodyweight v volume law of windsurfing but the Quatro has considerably more volume than the old wave board and I was getting around ok on it. And we wonder why the sport isn't doing all that well. I've had the same thing happen when I dragged out old shortboards. It's funny, in my other sport the people who snigger at older gear are frowned upon, but in windsurfing it's accepted - but it leaves a bad taste in the mouth. A good sailor on '90s gear (or older) will still blow a LOT of windsurfers away. Is that Iron Cove or Narrabeen? It could be that they are on longboards, which are still faster than shortboards a lot of the time. The funny thing is people were saying, "There no way you will have any fun in that old gear". I'm thinking, 'We'll, I had a LOT of fun on that gear in the 80's, so why not now?' The muscle memory is still there; just not the muscles. They could be on longboards, especially at Iron Cove or Narrabeen. Congratulations. An old surfer is joined to us. 1. Windsurfers are always friendly in all over the world. Find a few windsurfer and get help from them. 2. Buy a second hand board ( 130-145 lt). 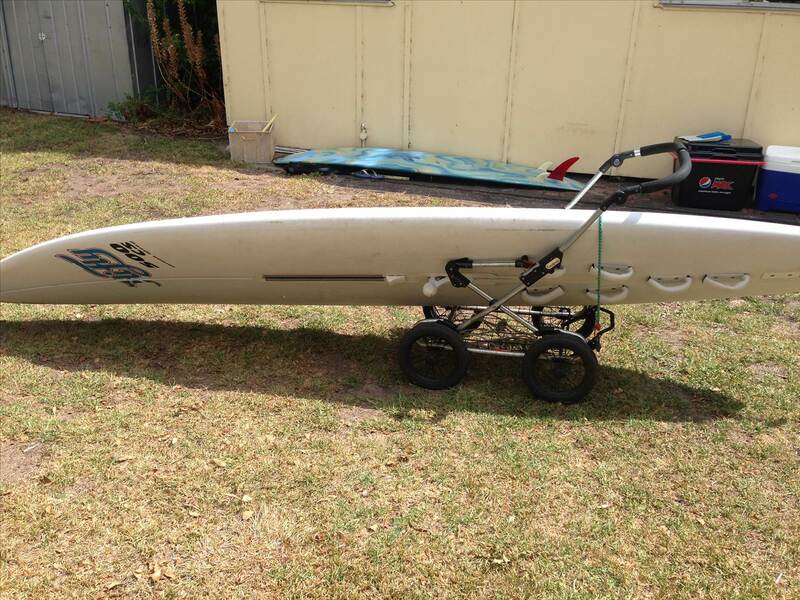 Fanatic-Starboard-F2 or JP but in good condition. 3.Buy a new sail 5 to 5.5 m2. Because your level is intermediate and sail life is max 4 years. Sun light is very strong in your country. 4. Buy a new SDM mast. (430 cm %25 -%55 carbon mast). You don't need %100 carbon mast. 5. Buy a new extension 30- 50 cm. 6. Learn water start and jibes. Does a package such as this fit the bill? Looks to me like a '90s "DSB" style board. They were needle-nosed, had a good top end, but nowhere near as easy or versatile as a modern shortboard. They are unstable and slow to plane, but once planing they do move. A newer and wider board is a much better option IMHO. Ok so I took the Quatro Freestyle Wave 75L out for the first time today and it was way more radical to ride than I thought it would be. My 1980's 8'6" custom fibreglass 60L wave board was heaps easier to sail. I thought the extra 15L would give me much more flotation and earlier planing but it was twitchy as hell and all over the place. I felt like I was riding a beer coaster... one of the round ones. The wind was only about 17kn and I'm about 90kg with a 5.0 wave sail; but I had no problem getting back on the old 60L wave board. The mast track on the old board is twice the distance from the footstraps so with the mast so far back the booms seemed too high. The fin seemed too small at 23cms but I see that is recommended for this board. I know I could/should have bought an 85-100L board but I am a frustrated wave sailor and don't think I want to just putt around in light winds just becaus I am old. Are there more adjustments to equipment or style that I should make? Or just persevere. Hang in there Agrid ! 18 months ago I returned to windsurfing after 28 years out and found that I could still water-start on my old McTavish wave board. I remember thinking "How brilliant am I?" I thought that everything would be super easy.....I was wrong! Big time wrong. The lightness of the new boards I found very twitchy and the acceleration going off the wind I found terrifying at first. Once you regularly get back in the footstraps and on a beam reach it'll come back nicely I'm sure. If you have the mast right back in the track ( speed) it'll be twitchy.....maybe start with it, say, 60% forward which will help you get planing earlier. Try the boom at chin height and you'll probably have more control and above all get the sail rigged right. I kept asking my Mandurah Mob mates how to get it right and they were all great about helping.....not enough downhaul and the sail will just not work right....it will feel gutless. There's nothing I haven't done wrong in my sailing renaissance but I've had a great time trying to get it right. I just jumped back on a sailboard today after 10 years off kiting, bit like a bike, you don't forget but I found some new muscles! I'll still kite but the sailboard has it's place in my quiver. I went with a 100 litre board. I could have used a few more litres when the wind dropped and I had to haul the sail up rather than water start, but it felt great when planing. Enjoy! So, all the brochures weren't lying to us? They really were getting lighter and faster and better, incrementally, each year? I suppose people who have kept sailing have made incremental adjustments but I've stepped out of the Time Tunnel from 20 years ago and everything has changed. Hey, all the cool kids ride big board, small sail these days (as you are finding boards are much more manoeuvrable now). Most sailors wouldn't go less than the bodyweight in litres unless its super windy. At 90kgs, IMHO you would find a 90-100l board a lot more fun and there are heaps of good wave & free wave options in this size. That said, for getting back into it, and on topic, I'd get a modern, wider short board (maybe 20-30lt above kgs in weight, and add one about 1:1 volume to weight a bit later). In terms of free-ride boards, I think that there was massive progress between 2000 and 2007 - subsequently not much progress. A freeride board is a trade-off between speed and maneuverability and ease of sailing - they change the trade-offs slightly every year. I recently bought an immaculate condition 2008 Taboo Rocket 145 for a friend who is just getting into the harness - I was surprised how nice it felt for an advanced sailor - and to be honest I felt that the trade-offs that Taboo had made were spot on: A brand new, latest shape free-ride would not be any better. However, a long narrow freeride from 2000, like a Fanatic Bee 140, would not be as good/easy as the Taboo Rocket (although top speed would be similar). If I look at dedicated Slalom kit, I do see some progression, especially in the mid size boards. Without any doubt, I go faster on my 2015 107L slalom board than I did on my 2013 or 2008 slalom board (Using a GPS), some of this may also be down to improvements in sails, and possibly I am getting better (but I doubt that). I also find that the newer boards have a slightly wider sail range, and are less prone to spinning out. The biggest slalom boards (130+L and 82+cm wide) also have a much wider wind range and are more controllable with smaller sails in higher wind than similar boards from 5 years ago (but they do not plane any earlier). With the smallest slalom boards, I am not convinced that as a whole package they are any better than they were 5 years ago - a small slalom board has to make a trade off between speed and control in wild conditions - my current small slalom is faster than my old one, however, it is more difficult to sail and gybe. I use slalom sails, my F2011 North Warps were radically better in almost every respect compared with my previous 2006 Neil Pryde RS Slalom, Which in turn were massively better than my 2000 Sailworks XT race sails. However, my F2013 North Warps were only marginally better than the F2011 WARPs and were probably slower, but the 2015 GA Vapors are a big improvement over the 2013 North WARPs.